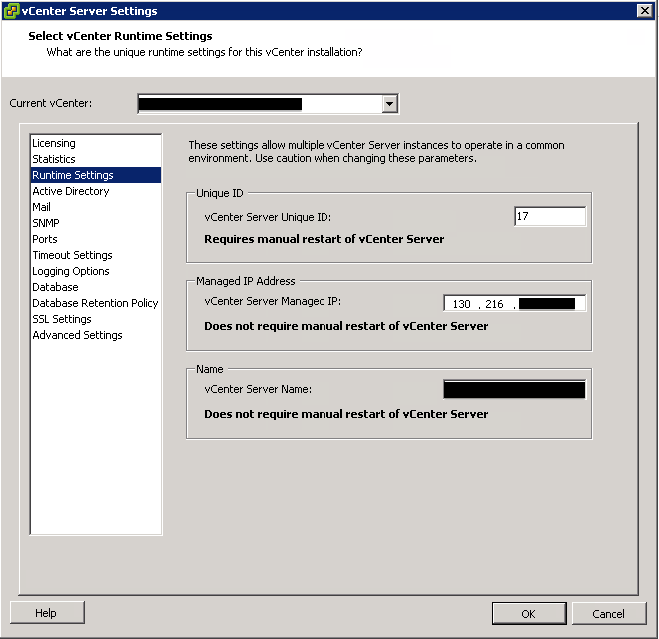 Recently, due to the subnet decommission, had to change IP addresses of two vCenter servers. After changing the IP addresses, the ESXI servers under each vCenter servers were disconnected. I thought this was a normal behaviour after the modification. Thus, I re-connected the servers and it was successful. Few minutes later, ESXi servers were disconnected again. While Googling, found an KB article to this issue (http://kb.vmware.com/selfservice/microsites/search.do?language=en_US&cmd=displayKC&externalId=1001493). The problem was that the vpxa.cfg (vCenter Server Agent configuration file) file under /etc/opt/vmware/vpxa/vpxa.cfg in ESXi server stored the old IP address of the vCenter server. Since I am a CLI person, applied the first method and ESXi servers were connected back to the vCenter servers. However, after having a cup of coffee, found out they were disconnected again! Checked the vpxa.cfg file and it was still pointing to the old vCenter server IP address. Thought second method should work. I tried it but still, same consequence. While investigating into the vCenter settings, I found that under Runtime Settings, vCenter Server Managed IP was set to the old IP address! After changing it to the new IP address, I tried the first method and it fixed the issue. In summary, make sure you change the Managed IP Address under Runtime Settings before applying any methods suggested on the KB article, otherwise, you will see the same thing over and over! regarding this article. I desire to read even more things approximately it! Thank you very much. I have been fighting this for hours. Hi steven, I need to change the IP Address on my vcenter and the ESXi hosts, could you please tell me the best way to do it.